You helped Preserve American Revolutionary War History! Although the Gaspee Affair is accorded various degrees of importance in the events that gave rise to the American Revolution, there is general agreement among historians that the shot fired by Joseph was the first time an American deliberately shot an English military man in a deliberate attack on the English military. The English Attorney General and the Solicitor General declared for the first time that there was treason and an American act of war. This society, in 2003, placed a small marker to commemorate Joseph Bucklin 5th, the patriot who fired the rifle shot that Rhode Island proudly claims was really the “First Shot in the American Revolution“. Joseph had no marker in the 18th century family plot (because he was lost at sea). Importantly, future generations needed to know the family connections of the Bucklin who fired the famous shot in the 1772 capture of the English Navy ship Gaspee! In 2003, we had the Bucklin family grave area cleaned up. After we had one full ten ton dump truck of debris removed, and placed our brass marker the site looked like this. Thanks the persons who showed up to help. 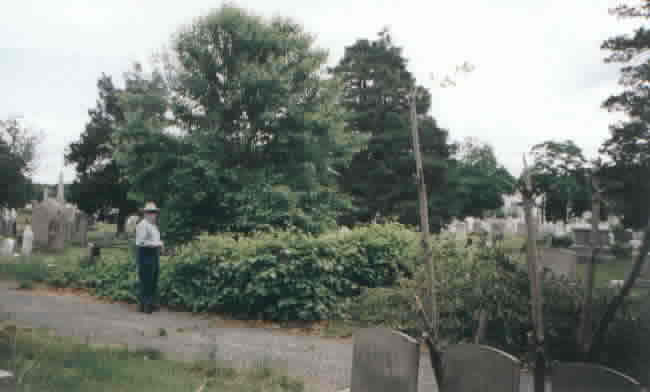 The next photo shows you the state of the grave site in 2003. The man in the photo is standing in front of a large group of bushes and vegetation. That was the Joseph Bucklin family site. There was almost a foot of debris on the site! Although a great deal of money had been spent for splendid stones (expensive carving by a master carver of the time) in the 1700’s, there was no marker placed for son Joseph 5th, who died at sea. The entire family site was in danger of being lost under a sea of vegetation! Make a difference in preserving history! Joseph’s father — Capt. Joseph Bucklin 4th — was a prominent man of the day. During the entire Revolutionary War the identity of the Gaspee Raiders was kept secret, because of the huge reward the King had placed on the head of the raiders. Joseph Bucklin 5th was lost at sea near the end of the war, and nothing was published about him. So in the 1800’s some persons writing about the incident assumed wrongly that “Joseph Bucklin” meant the Captain Joseph Bucklin of Providence. Joseph Bucklin 4th was a prominent man of the time, from a prominent family. The Bucklin landholdings across the river from Providence were larger than the entire city portions of Providence, and Bucklins owned many of the water powered mills in the area. Joseph 4th used family capital to go into the merchant shipping business. Called “Captain” because he really was the captain of his own ship for his business, Captain Bucklin reacted to the English taxes on imported goods by ignoring them. His ships twice were confiscated for tax avoidance (“smuggling” the English called it). Capt. Joseph Bucklin 4th participated in advisory capacities in public committees involved in the Revolutionary War. He was involved with supervising the fortification of Fort Independence, guarding the port of Providence. Capt. Bucklin also was a member of the Rhode Island’s legislature’s “Committee of Correspondence” that was organized to coordinate the resistance of the colonies to England. In addition, with other leading merchants, Capt. Bucklin was in the committee formed by Providence to enforce of the ideas of the First Continental Congress to help the war effort. These were important committees, on which were the distinguished men of Providence. Read more about Capt. Joseph Bucklin 4th. 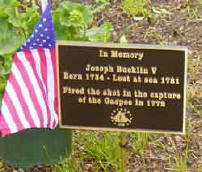 And be sure to read more about his son, Joseph Bucklin 5th, the patriot who shot the English Navy captain. We placed at the family gravesite an appropriate bronze marker proclaiming “In memory of Joseph Bucklin 4th” with an inscription noting his key role in the American Revolution. The Rhode Island Historical Society and the Historical North Burial Ground (where this site is) thought it a good idea, but declined to pay anything for it in these years of governmental budget-cutting so it was up to us. It was difficult and time-consuming to find the history that proved which Joseph Bucklin it was that fired the shot (There were about a dozen Joseph Bucklins in the area about the time of the Revolution). It took three years of research to find the definitive evidence and disprove inaccurate careless historical references indicating the shooter was the famous Joseph Bucklin 4th instead of his relatively unknown son. But we have done the research and preserved the history in written form..